Soft, stylish and super convenient, the Volcom® What A Stud bag keeps you set for day! Faux leather hand bag. Zippered main compartment fits your daily essentials. Hammered studs adorns front. Metal logo plate at front pouch. Dual carry handles. 100% polyurethane. Imported. Measurements: Bottom Width: 13 in Depth: 3 in Height: 9 in Strap Length: 29 in Strap Drop: 11 in Weight: 1 lb 1 oz This product may have a manufacturer's warranty. Please visit the manufacturer's website or contact us at warranty@support.zappos.com for full manufacturer warranty details. 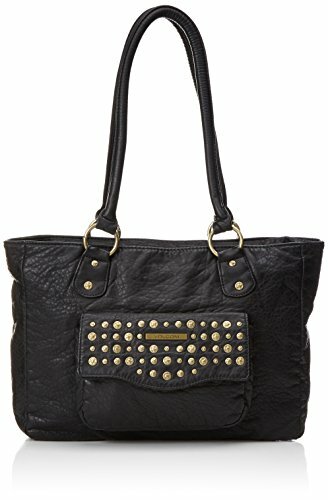 Soft, stylish and super convenient, the Volcom® What A Stud bag keeps you set for day! Zippered main compartment fits your daily essentials. Metal logo plate at front pouch. Dual carry handles. 100% polyurethane. Imported. Measurements: Bottom Width: 13 in Depth: 3 in Height: 9 in Strap Length: 29 in Strap Drop: 11 in Weight: 1 lb 1 oz This product may have a manufacturer's warranty. Please visit the manufacturer's website or contact us at warranty@support.zappos.com for full manufacturer warranty details.